How many (acute) angles are there in the picture? 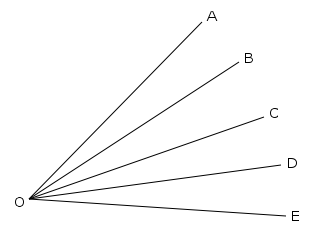 Name the 4 unit acute angles; that is, ∠AOB, ∠BOC, ∠COD, and ∠DOE. Thus, there are 4 + 3 + 2 + 1 = 10 angles in all. We could also consider the two lines that form each angle. We see that there are five ways (A, B, C, D, or E) to choose the first line and four ways to choose a second line to complete the angle. However, we also see that some of these combinationssuch as AOB and BOAare the same angle. In fact, we are counting each angle twice! Therefore we divide the end result by two and find that there are 5 × 4 ÷ 2 = 10 angles.